The Home Entertainment Market continues its path of growth. A resilient industry currently worth in excess of £2.34 billion. Across all transactional formats, ownership accounts for 83% of the market across disc and digital, while digital rental represents 14%. Subscription video-on-demand now delivers over £1.29 billion to the market with. 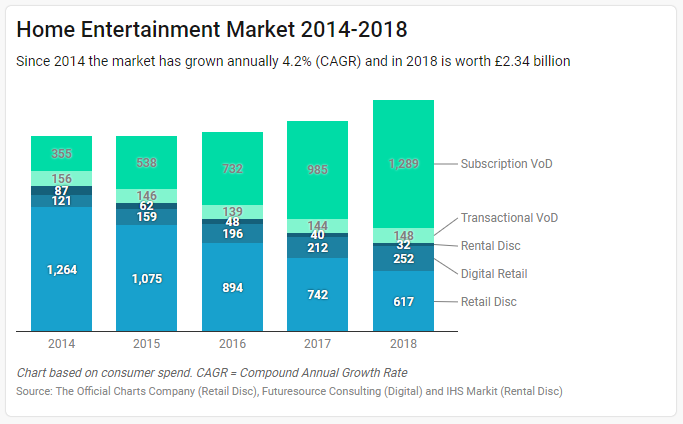 In 2018 over 64m discs were bought and on digital retail near 20m films were purchased. Over 16.4 million people bought or rented home entertainment content in 2018, with 17% doing both at least once throughout the year. For owned content, the average spend per shopper is £54.37. Within this figure, the average spend for EST is £45.06 per shopper. In 2018 Blu-ray and EST saw the average number of units purchased increase year-on-year, with Blu-ray customers purchasing five or more discs rising from 12% to 13%, whilst EST customers purchasing five or more titles increased from 20% to more than 23%. 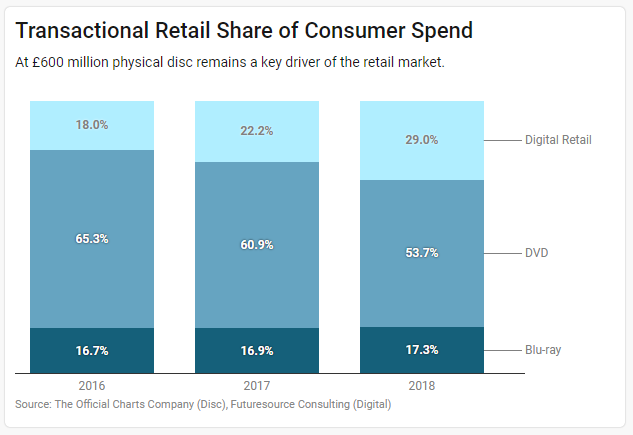 61% of disc purchases in 2018 were planned; Blu-ray purchases saw an even higher percentage, with 76% of purchases planned. TVoD saw the largest year-on-year increase in planned transactions, up to 71%. These increases indicate that subscription and catch-up services continue to fill the gap for impulse content consumption. In-store measurements show impulse buying is down 10 percentage points year-on-year, though unplanned purchases still account for 58% of all film catalogue volume sales. 24.6% of spend is attributed to gifting in 2018, up almost one percentage point year-on-year. The volume share of purchases, however, remained static, indicating an increase in the average price paid by shoppers for content intended as a gift. On a format level, gifting was driven primarily by DVD content across both new release and catalogue titles. 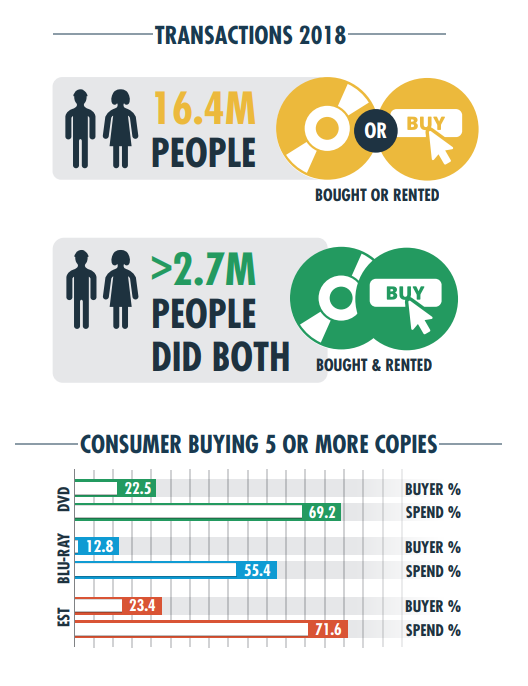 During 2018, the share of discs purchased rose for both under 35s and 35-54s. The under 35s favour specialist and internet retailers, with over 31% of disc spend attributed to these retailers. Grocers see the strongest share of spend from the over 55s, with 38%; almost five percentage points higher than the overall market. The over 55s show their spending power on DVD, with a near 37.5% share of the market, four percentage points higher than the overall market share they represent. Across Blu-ray and 4K UHD formats over a third of sales are accounted for by under 35s. On 4K UHD alone, share of spend for the under 35s at 34% is nearly 12 percentage points higher than the share this age group represent for DVD spend.